We are Waterville's Environmental Leader The Waterville Holiday Inn-pet friendly hotel is the only place business, leisure & eco-friendly travelers choose to stay with while in Central Maine.Coming soon Hathaway Creative Center Also nearby are, Sappi Fine Paper, New Balance, Cianbro, Huhtamaki, Inland & Maine General Hospitals, & First Park featuring T-Mobile.Come visit Colby, Thomas, & Unity Colleges, Belgrade Lakes & Golf Course, Natanis Golf & Country Club, & Waterville's Opera House (Check out Live at the Opera House series). Augusta is 20 miles south and Bangor is 55 miles north.The Waterville Holiday Inn is everything you desire in your travels: pet & eco friendly accommodations, friendly & knowledgeable staff, & outstanding guest services Our 138 guestrooms are dedicated to comfort & convenience with the features that all our guests value. Features include free high-speed wireless Internet, Priority Club, Key Club, an indoor salt water, heated pool & fitness center & Killarney's Irish Restaurant & Pub So whether you're in town for business or vacation. 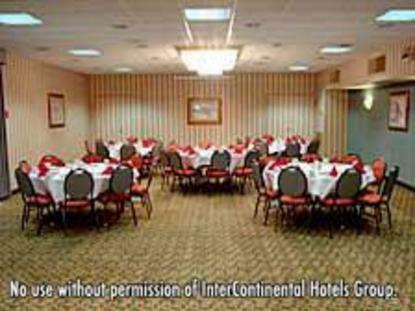 The Waterville Holiday Inn Hotel is the place to be, conveniently located off I-95 at exit 130. From check-in to check-out, we are "Central Maine's finest full-service pet friendly, green hotel" This hotel is committed to providing accessible facilities under the American Disabilities Act. If your accessibility needs are not met, please contact the Hotel Manager on Duty. Should you require additional information regarding accessible facilities for guests with disabilities, please call 1-800-Holiday (U.S. and Canada) or contact the hotel directly. For the hearing impaired, TDD service is available at 1-800-238-5544 within the U.S. and Canada.